Welcome back to another journey through the wonders and terrors of New England. Twenty Wicked Tales of fear, madness and horror from the region's most prolific writers of dark fiction. 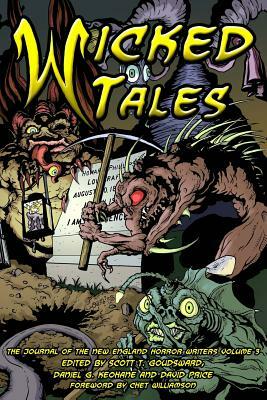 Contains stories from Michael J Arruda, Matthew M. Bartlett, E. A. Black, Kristin Dearborn, Peter N. Dudar, Timothy P. Flynn, Sam Gafford, Christopher Golden, John Goodrich, Rick Hautala, Bracken MacLeod, John McIlveen, Paul McMahon, Holly Newstein, David North-Martino, Howard Odentz, Rob Smales, L. L. Soares, Trisha J. Wooldridge, K. H. Vaughan and T. T. Zuma. Introduction by Chet Williamson, and covert art by Ogmios. The New England Horror Writers (NEHW) provides peer support and networking for authors of horror and dark fantasy in the New England Area. NEHW is primarily a writer's organization, focusing on authors of horror and dark fiction in all mediums (novels, short stories, screenplays, poetry, etc) in the New England area. We are also open to professional editors, artists & illustrators, agents and publishers of horror and dark fiction. NEHW activities include book signings, readings, panel discussions at conventions, and social gatherings. With members ranging from Maine to Connecticut, NEHW events take place in varying locations in an effort to provide support for our members throughout New England. Find us on facebook or at www.newenglandhorror.org.